Nanotechnology is an emerging and promising field for advanced applications in industrial, commercial and medical sectors, and nanomaterials can be found today in sunscreens, deodorants and textiles. Yet these nanomaterials, which are increasing in number, are entering waste streams as part of end-of-life products along with conventional waste, without any real understanding of their environmental impacts or health risks on human beings and living organisms.This report provides a literature review on four specific waste treatment processes (recycling, incineration, landfilling and wastewater treatment). While state-of-the-art waste treatment facilities may collect, divert or eliminate nanomaterials from these waste streams, the report concludes that knowledge gaps associated with their final disposal remain, underlining the need for further research in this area. 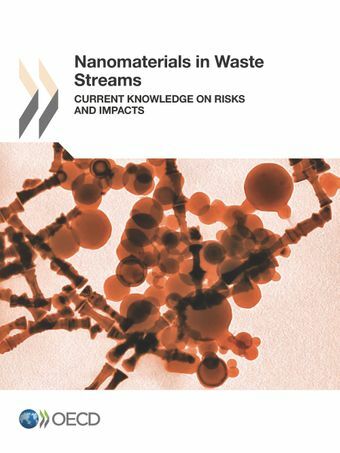 Since 2011, the OECD began an effort to understand the emerging issue of waste containing nanomaterials and to attract attention to the potential risks that are linked to the presence of nanomaterials in waste treatment processes. This report provides a preliminary examination of the issues of nanomaterials in waste streams. Given that the science in this area is rapidly evolving, further research and documentation is required to fully assess the safety of waste containing nanomaterials and their potential impacts on end-of-life treatment. Urgent research needed into risks from nanomaterials in household waste.